In celebration of Irvine Restaurant Week, Southern California chain Slater's 50/50 is testing two new over-the-top items for their menu: The Turducken Burger and the Supreme Pizza Poutine Fries. Created by Slater's innovative chef Brad Lyons, the two items are temporarily available for the event week of January 10-16. 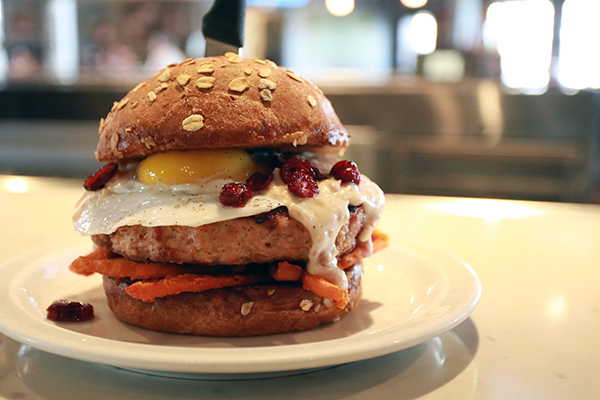 The Turducken Burger is essentially an entire Thanksgiving meal condensed into a single burger. The three main components that contribute to its namesake are turkey, duck and chicken. More specifically, a half turkey half chicken patty and a fried duck egg. 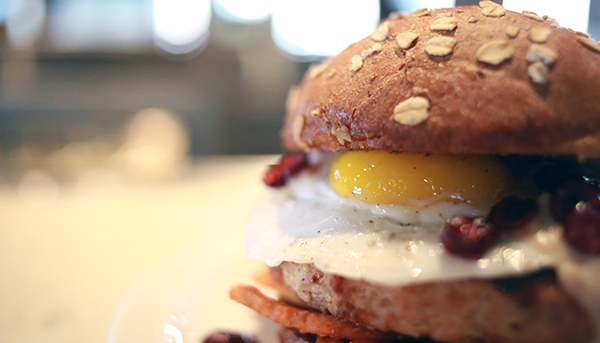 How badly do you want that yolk to pop? 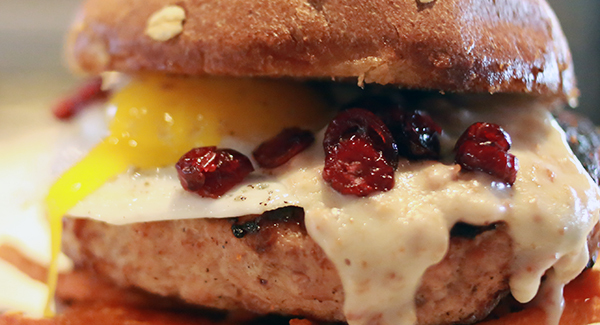 Naturally, the burger behemoth comes topped with bacon-infused country gravy with sweet cranberries. Think a sweet, salty hot mess all over your hands. 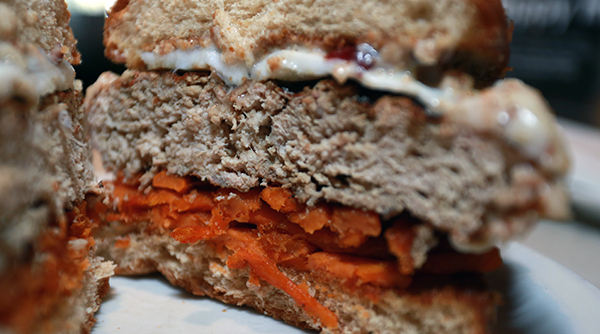 Check out that 50 percent chicken, 50 percent turkey patty stuffed with sweet potato fries. 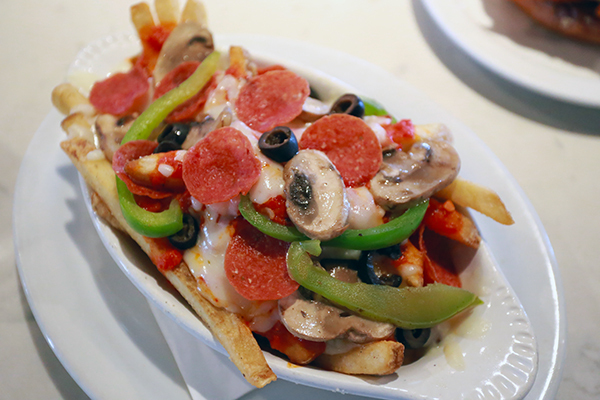 As an appetizer, the Supreme Pizza Poutine Fries offer fries smothered in a roasted red pepper coulis. 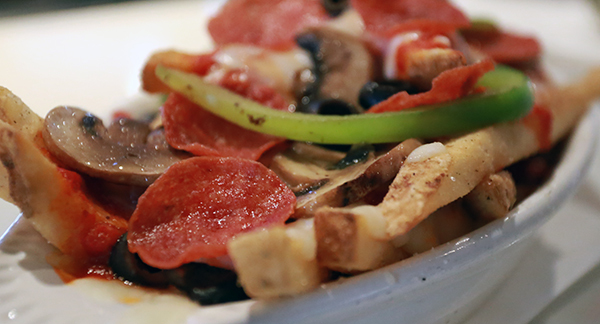 Then they're topped with melted mozzarella cheese, sautéed mushrooms, black olives, bell peppers and crispy fried pepperoni. If the new items are a hit, the Turducken Burger and Supreme Pizza Poutine could find a home on Slater's permanent menu. 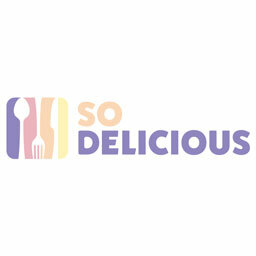 For the sake of all that is delicious, we're crossing our fingers this happens.